The Yamaguchi-gumi has spent almost a century building itself up into arguably the most powerful and largest organised criminal gang in the world. Its membership of nearly 30,000 comprises almost half of the yakuza crime syndicate in the Japanese underworld, earning billions of yen through drug trafficking, money laundering, fraud and extortion. But they may have met their match in the shape of a female restaurateur who has launched a lawsuit against the gang in what lawyers are calling a landmark case. The woman, from Nagoya, reportedly under 24-hour police guard, is suing Kenichi Shinoda, the sixth Yamaguchi-gumi kumicho, or godfather, who she says forced her to pay protection money over 12 years between 1998 and 2010. Using an anti-organised crime law revised in 2008, which says heads of organisations can be liable for damage done by its members and affiliate groups, the woman is demanding a refund of £120,000 in compensation and backdated protection money. She paid the extorted money each month to Yoshitake Matsuyama, head of a criminal group affiliated to the Kodo-kai, itself a subsidiary of the Yamaguchi-gumi. The funds, ranging in value from 30,000-100,000 yen (£200-£650), were deemed to be for the protection of the business – mikajimeryo in Japanese. The Yamaguchi-gumi, based in the western port city of Kobe, is threatened as never before in its 98-year history, as the law catches up with an increasing number of gang members. Last week 29-year-old Yujiro Kobayashi and three others were detained for a second time over a 1bn yen fraud that 450 people in Tokyo fell victim to. The scam involved phoning a victim and pretending to be a relative in need of money. Investigators say that three of the suspects, including Kobayashi, have denied the latest allegations, while the fourth has refused to comment. Five others arrested in the case were recruited by Kobayashi from Shiritsu University campus. “This is a lucrative job in which you’ll earn at least 10,000 yen a day,” the suspect is alleged to have said. Shinoda, 71, who has spent time in jail for killing a rival with a samurai sword, could soon find himself back in the dock. Rarely photographed, the gang leader broke with the typical black suit and shoes worn by many senior yakuza members when he was pictured leaving jail in 2011 after serving six years for illegal firearms possession, shortly after he took over control of the gang from his predecessor, Yoshinori Watanabe. 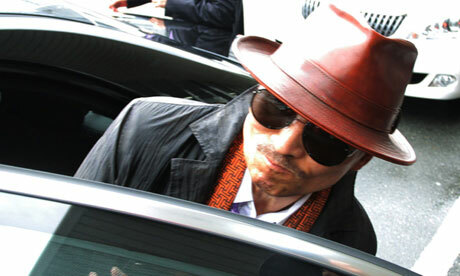 Dressed in a brown trilby and scarf, leather jacket and sunglasses, the Yamaguchi-gumi’s leader seemed satisfied with his gang’s activities while he was in jail. In 2010 the Kodo-kai gang burned down a hostess club called Infinity, killing several people, in a similar protection arrangement that went bad. The restaurant owner has said that she, too, was threatened with arson when she decided to stop paying. According to yakuza experts, a relative of one of the victims of the 2010 fire may sue, depending on the case’s outcome, and trigger a cascade of lawsuits that the Yamaguchi-gumi would struggle to deal with. Shinoda, who is also known as Shinobu Tsukasa, is keeping up appearances, as the legal paperwork is being prepared, having gone on his annual pilgrimage to the Nagamine Reien cemetery in Kobe earlier this month to commemorate the 32nd anniversary of the death of Kazuo Taoka, the gang’s third godfather. Yet he was worried enough about the lawsuit to distribute an eight-page glossy magazine last month to his 27,700 “regular” gang members with a headline that read “Let’s march through these challenges”. Shinoda argued that reform was needed to the gang’s business practices, which he argued were essential to the group’s survival. Japan‘s National Police Agency claims the number of Yamaguchi-gumi members has fallen by 3,300 in the last 12 months. Whether their financial position will be broken by their centenary year in 2015 will depend a lot on the outcome of the Nagoya lawsuit. Is new yakuza journal good news for Japan?